BSNL is all set to make buying of premium number very easy by selling them via e-auction on its newly developed website. Along with the online bidding BSNL also plans to offer the same via SMS, though SMS bidding facility can only be used by its subscribers. 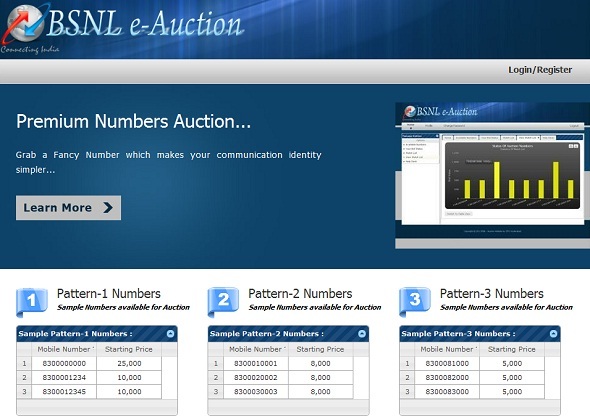 The newly developed portal eauction.bsnl.co.in is supposed to go live on 1st June. This is a nice move by BSNL, considering the fact that it will bring more partiality and convenience for the buyers. It will increase the scope and reach of the customer’s across PAN India. Any customer with or without BSNL number can easily participate through web interface. Easy to participate in the auction and pay the requisite amounts in a secured and transparent procedure. To enhance the participation of customers in the auction in a true competition spirit, sitting at home. We will be sharing more details about it very soon. Apple files patent for an ‘Optical Stylus’, Will it be the iPen?